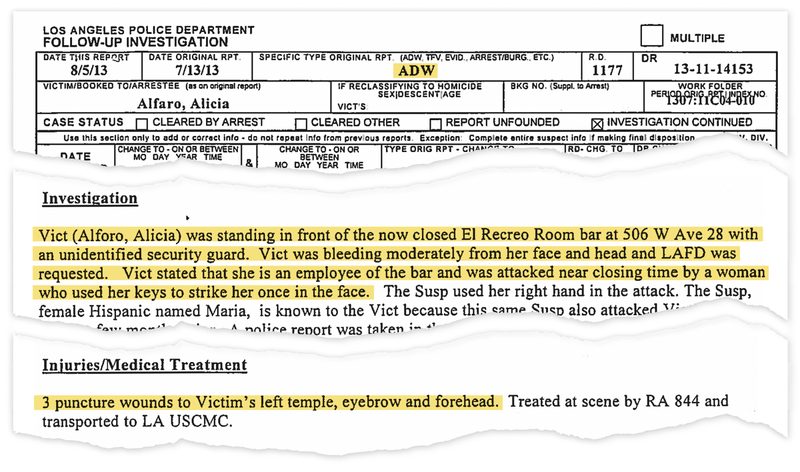 In July 2013, Alicia Alfaro was attacked with a set of car keys during a fight outside a Cypress Park bar and suffered puncture wounds to her face. The LAPD initially categorized the incident as assault with a deadly weapon (ADW) or an aggravated assault, which is the correct classification according to FBI rules. The incident was later downgraded to a misdemeanor battery (simple assault), a minor offense not counted in the city’s official violent crime statistics. Police officials now say the decision to change the offense was wrong.